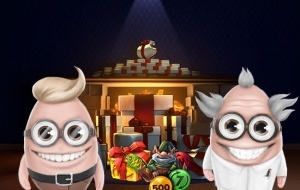 The Cashmios are still on their quest of finding Santa, and if you’ve been following the story so far you’ve might have picked up some nice bonus spins along the way. Many more spins are up for grabs, and this week you can get spins on great games such as Big Bot Crew and Wins of Fortune! The fun doesn’t end there. If you’ve made a deposit during the past 6 months you can also pick up 40 bonus spins on the spooky NetEnt slot Blood Suckers 2 by depositing £50 or more. Cashmio’s Christmas calendar is available until the 31st of December, and we expect that the offers only get juicier from here. Note that the bonus spins have a wagering requirement of x45. Cashmio is an excellent UK online casino that offers many surprises such as slot tournaments and missions. As a loyal player, you can always expect to be treated with weekly bonus spins offers on the most popular games around. If you haven’t played at Cashmio before, you can get started with 150 bonus spins when you make your first deposit! Simply activate the welcome bonus in the cashier and deposit £20 or more, and you will instantly get 150 bonus spins on Starburst. The bonus spins have a wagering requirement of x45, and Cashmio’s bonus terms and conditions apply. Why not use your winnings to check out some of the new exciting slots that arrived at Cashmio this week? Some of the highlights include Reactor by Red Tiger, Star Joker by Play’n GO, and Queen of Mars from Edict. Click on the link and register an account at Cashmio to get started!